It's my distinct pleasure to introduce to you the fine work of Tony Wolf and Joao Vieira: Suffrajitsu, or Mrs. Pankhurst's Amazons. 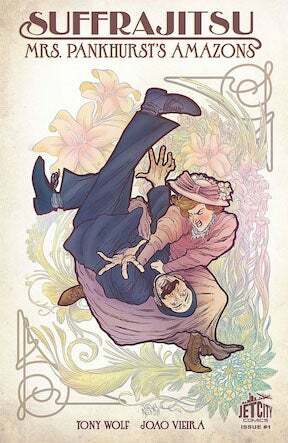 It posits that most excellent question: What if women fighting for the vote in Edwardian London knew Kung Fu? The answer is formidable. Mrs. Emmeline Pankhurst leads a small army of suffragettes in her campaign for women's votes. A chief lieutenant, Ms. Persephone Wright, is our protagonist and most ardent activist in the good fight. With Patriarchal calumny on the lips of every mustachioed 'gent' on the streets of London, Mrs. Pankhurst and her amazons have no choice but to take matters into their own hands— courtesy of Bartitsu lessons bestowed by Persephone's uncle Edward. Armed with just cause and stalwart hearts, our heroines take to the streets to protect their own at public speaking engagements to sway the minds of the ill-informed. These women will not be ignored, nor will they stomach disrespect of any stripe. Behold Johnny Commonlaw, brimming with misogyny! Behold our Flossie, ready to snap that rude gesture off his hand at the wrist! O-ho! The important distinction is that these heroines don't strike first. No. They hope for peaceful demonstrations. (Except Flossie.) However, when London's Finest come a-marching to break up their assembly, these brave ladies are forced to disband or defend themselves. They will not disband. The comic is a corker: It captures dramatized Edwardian life in a most vivid display. The language marches forth with commanding cadence, the wardrobe is nothing less than gorgeous, and the iron in these characters is impossible to ignore. These heroines vie for equality, for their personal freedom, and eventually, for much more than they bargained for. Following her arrest at one such assembly-turned-brouhaha, Persephone is embroiled in a plot that reaches higher than any mere rights and politics. I'm sworn to secrecy as to the nature of this development. To uncover its secrets, you will have to pick up the comic for yourself. Upon witnessing these dread calamities, you must not cry out! It's terribly important. The comic's origins are steeped in real-life history. You can learn more about it here. Suffrajitsu may be found in any forward-thinking establishment, where books and publications for the stout of heart are sold. Failing to do so would be a disservice to yourself. Go forth, brave reader! Go forth and join the crusade! You'll be most glad that you did. Casey Jones is a writer and voiceover artist with a day job, and an ardent supporter of women's rights.